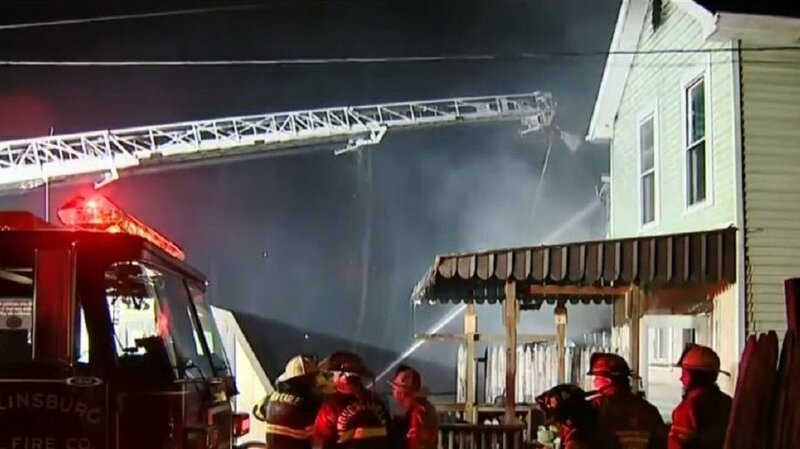 A man died Tuesday night after a fire ripped through his Forward Township home. Robert Morgan, 75, died at 5:30 p.m. inside his house on Morgan Run Road, the Allegheny County Medical Examiner’s Office said Wednesday. His cause and manner of death has not yet been released. According to the medical examiner’s report, Morgan died about 14 minutes before fire crews arrived to confront a “heavy fire” engulfing his two-story residence near the border of Allegheny and Westmoreland counties. Initially, officials thought no one was inside the burning home, Brown said. Allegheny County 911 dispatchers received a call about flames and smoke at the residence shortly after 5:30 p.m.
Fire crews arrived at 5:44 p.m. to confront a “heavy fire,” with the flames threatening to spread to neighboring homes, Allegheny County Chief Fire Marshal Matthew J. Brown said. Emergency medical service workers, firefighters and police responded from Allegheny as well as Westmoreland counties. Firefighters began to battle the fire from the interior, but then the second floor began to sag and presented a threat, Brown said. All crews were told to evacuate. “Upon re-entry, one victim was found on the first floor,” Brown said. Officials have not yet determined what caused the fire or where it started. Two firefighters suffered minor injuries. One was treated on scene for a burned ear. The other had asthma issues and was taken to a nearby hospital. The American Red Cross is assisting the occupants of a nearby home that sustained fire damage. County fire officials and the medical examiner’s office are investigating. 100% of the royalties from the sales of "PASS IT ON" will be donated to the National Fallen Firefighters Foundation and the Chief Ray Downey Scholarship Fund. CLICK ABOVE TO ORDER YOUR COPIES TODAY! Copyright Disclaimer: This non-commercial, non-profit and free use website is for the exclusive purpose of firefighter safety, health and survival. All photographs in these posts are either submitted or from aggregate Google and are used in the postings for the purposes of education, satire, and parody, criticism, news reporting, research, and scholarship consistent with 17 USC §107 and never due to intentional or malicious misuse of a copyright.